Sperm fixation in better conditions is a requisite for the examination of sperm morphology using optical microscopes. Here, we investigated the effects of different fixatives on sperm morphological characteristics in four marine fishes: copulatory sculpins Pseudoblennius marmoratus and Radulinopsis taranetzi, and non-copulatory sculpin Icelus mororanis and dragonet Repomucenus beniteguri. We found that a 2.5% glutaraldehyde solution is optimal for observing sperm morphology in these fishes. Furthermore, the low concentrations (2.5%) of formalin could be useful, but the solvent for diluting formalin should be changed depending on the species: seawater in copulatory and non-copulatory sculpins and isotonic solution in the non-copulatory dragonet. The online version of this article ( https://doi.org/10.1007/s10228-018-0672-1) contains supplementary material, which is available to authorized users. We thank Hiroyuki Munehara, Atsuya Miyajima, Nagaaki Sato, Namiko Sato, and the members of Usujiri Fisheries Station, Hokkaido University, for their help during sampling at Usujiri, Hakodate, Japan. We are also grateful to Tamaki Oguro for his help with fish sampling at Tassya Fishing Port, Sado, Japan. We thank Hironori Ando, Takashi Kitahashi, Midori Iida, and the members of Sado Marine Biological Station, Niigata University, for their fruitful discussion at all stages of the work. Two anonymous reviewers greatly improved this manuscript. We would like to thank Editage (http://www.editage.jp) for English language editing. 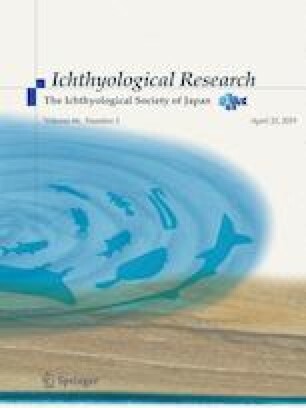 This study was funded by JSPS KAKENHI, Grant No. 16H04841 and 17K19518 to SA, and partly funded by the Sasakawa Scientific Research Grant from the Japan Science Society, Grant No. 29-541 to TI.